Surds - what a fabulous topic to teach! I love the abundance of resources available and I’ve listed some of my favourites below. Pupils list the first twelve square numbers in their books for reference throughout the lesson. They need to readily recognise square numbers in order to simplify surds so the more they practise listing them, the better. When manipulating expressions containing surds (eg expanding brackets) I make comparisons to what they already know about algebra. For example √2 and √3 can be thought of in the same way as x and y (ie not ‘like terms’) whereas 2√3 and 5√3 can be thought of in the same way as 2x and 5x (ie we can add them to get 7√3). This blog post has some more ideas for introducing the concept of surds. And I like this on the history of surds. And here’s some resources recommended by the TES. For a lovely set of surds problems, see my Problem Sets page. 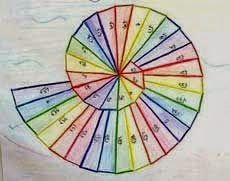 Finally, if you're looking for something really creative, check out this Wheel of Theodorus Art Project. What a fabulous summary of several lesson plans! Thanks for these. 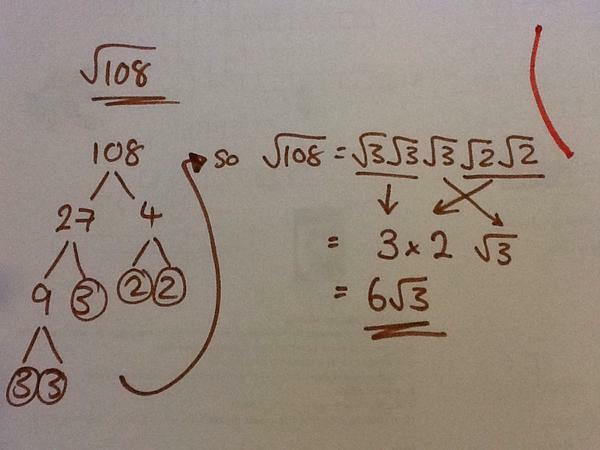 This year I've started teaching simplifying surds using a prime factor tree. It works perfectly and removes the need for a list of square factors.